^ a b c d e f g h i j k l m n o p q r s Anglada-Escudé, G.; Amado, P. J.; Barnes, J.; Berdiñas, Z. M.; Butler, R. P.; Coleman, G. A. L.; de la Cueva, I.; Dreizler, S. et al. (25 August 2016). “A terrestrial planet candidate in a temperate orbit around Proxima Centauri” (英語). Nature 536 (7617): 437–440. doi:10.1038/nature19106. ISSN 0028-0836. http://www.eso.org/public/archives/releases/sciencepapers/eso1629/eso1629a.pdf. ^ a b A Potentially Habitable World in Our Nearest Star. Planetary Habitability Laboratory. 24 August 2016. ^ a b c d Clery, Daniel (2016年8月26日). 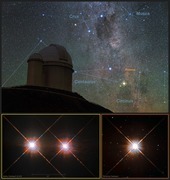 “The exoplanet next door”. Science News. http://science.sciencemag.org/content/353/6302/857?utm_campaign=toc_sci-mag_2016-08-25&et_rid=120011976&et_cid=747923 2016年8月28日閲覧. "Researchers have already found hundreds of similarly sized planets, and many appear to be far better candidates for hosting life than the one around Proxima Centauri, called Proxima b." ^ a b Amos, Jonathan (2016年8月24日). “Neighbouring star Proxima Centauri has Earth-sized planet”. BBC News. http://www.bbc.com/news/science-environment-37167390 2016年8月25日閲覧. "Just how "habitable" this particular planet really is, one has to say is pure speculation for the time being." ^ a b c Ribas, Ignasi; Bolmont, Emeline; Selsis, Franck; etal (25 August 2016). “The habitability of Proxima Centauri b: I. Irradiation, rotation and volatile inventory from formation to the present” (PDF). Astronomy & Astrophysics. https://arxiv.org/pdf/1608.06813.pdf 2016年8月28日閲覧。. ^ a b Ségransan, D.; Kervella, P.; Forveille, T.; Queloz, D. (2003). “First radius measurements of very low mass stars with the VLTI”. Astronomy and Astrophysics 397 (3): L5–L8. arXiv:astro-ph/0211647. Bibcode: 2003A&A...397L...5S. doi:10.1051/0004-6361:20021714. ^ Demory, B.-O. ; Ségransan, D.; Forveille, T.; Queloz, D.; Beuzit, J.-L.; Delfosse, X.; Di Folco, E.; Kervella, P. et al. (October 2009). “Mass-radius relation of low and very low-mass stars revisited with the VLTI”. Astronomy and Astrophysics 505 (1): 205–215. arXiv:0906.0602. Bibcode: 2009A&A...505..205D. doi:10.1051/0004-6361/200911976. ^ Ségransan, D.; Kervella, P.; Forveille, T.; Queloz, D. (2003). “First radius measurements of very low mass stars with the VLTI”. Astronomy and Astrophysics 397 (3): L5–L8. arXiv:astro-ph/0211647. Bibcode: 2003A&A...397L...5S. doi:10.1051/0004-6361:20021714. ^ Schlaufman, K. C.; Laughlin, G. (September 2010). “A physically-motivated photometric calibration of M dwarf metallicity”. Astronomy and Astrophysics 519: A105. arXiv:1006.2850. Bibcode: 2010A&A...519A.105S. doi:10.1051/0004-6361/201015016. ^ Jao, Wei-Chun; Henry, Todd J.; Subasavage, John P.; Winters, Jennifer G.; Gies, Douglas R.; Riedel, Adric R.; Ianna, Philip A. (2014). “The Solar Neighborhood. XXXI. Discovery of an Unusual Red+White Dwarf Binary at ~25 pc via Astrometry and UV Imaging”. The Astronomical Journal 147 (1): 21. arXiv:1310.4746. Bibcode: 2014AJ....147...21J. doi:10.1088/0004-6256/147/1/21. ISSN 0004-6256. ^ Christian, D. J.; Mathioudakis, M.; Bloomfield, D. S.; Dupuis, J.; Keenan, F. P. (2004). “A Detailed Study of Opacity in the Upper Atmosphere of Proxima Centauri”. The Astrophysical Journal 612 (2): 1140–1146. Bibcode: 2004ApJ...612.1140C. doi:10.1086/422803. ^ a b c Singal, Ashok K. (2014). “Life on a tidally-locked planet”. Planex Newsletter 4 (2): arXiv:1405.1025. arXiv:1405.1025. Bibcode: 2014arXiv1405.1025S. ^ Barnes, Rory, ed. (2010), Formation and Evolution of Exoplanets, John Wiley & Sons, p. 248, ISBN 3527408967, https://books.google.com/books?id=-7KimFtJnIAC&pg=PA248. ^ Heller, R.; Leconte, J.; Barnes, R. (April 2011). “Tidal obliquity evolution of potentially habitable planets”. Astronomy & Astrophysics 528: 16. arXiv:1101.2156. Bibcode: 2011A&A...528A..27H. doi:10.1051/0004-6361/201015809. A27. ^ Makarov, Valeri V. (June 2012), “Conditions of Passage and Entrapment of Terrestrial Planets in Spin-orbit Resonances”, The Astrophysical Journal 752 (1): 8, arXiv:1110.2658, Bibcode: 2012ApJ...752...73M, doi:10.1088/0004-637X/752/1/73, 73. ^ a b c The habitability of Proxima Centauri b - II. Possible climates and observability. Retrieved 25 August 2016. ^ Barnes, Rory (24 August 2016). “The Habitability of Proxima Centauri b I: Evolutionary Scenarios”. Astrobiology: 62. arXiv:1608.06919v1. ^ Aron, Jacob. 24 August 2016. Proxima b: Closest Earth-like planet discovered right next door. New Scientist. Retrieved 24 August 2016.